The next time your tooth is broken or rotten and you need a new one, your dentist might drag out a three-dimensional printer and fabricate a new tooth that fits perfectly in your mouth within minutes. Although this sounds like a scene from a science fiction movie, the technology is already developed. 3D printing, which fabricates a solid object by building up successive layers of materials, usually plastic or metal, has lit the technology world on fire. Aerospace, military, architecture and industrial design professionals are all using it. But Xiao Lan, director of the Beijing New Material Development Center, under the Beijing Municipal Science and Technology Commission, believes its most viable immediate use is replacing teeth and bones. "The medical industry is the one with the greatest market potential, since it's related to each individual person," says Xiao, adding that experts and doctors in Beijing have already made solid progress in this field. "3D printing will have a revolutionary effect [on the medical industry]," says Tang Zhihui, doctor of dental medicine and clinical professor at the Peking University School of Stomatology. According to Tang, 3D printing can help dentists in many ways, including printing braces, surgical guide plates and even artificial teeth. Since no tooth is the same, the patient's mouth can be scanned and a digital three-dimensional model built. The printer can fabricate anything the dentist needs. In Beijing, three dogs were implanted with false teeth fabricated by a printer, and three months later they are adapting well without any rejection by the body, said Tang. Liu Zhongjun, professor and director of the orthopedics department of Peking University Third Hospital, has gone further. Liu and his team are the first in China that have carried their research to the phase of clinical trials. Liu told Metropolitan that they have put artificial implants fabricated by 3D printers into 40 patients over the past year. "The overall situation [of the patients] is looking good," Liu said. Liu's studies will mainly help patients who suffer from degenerative joint disease and degeneration of the spine. 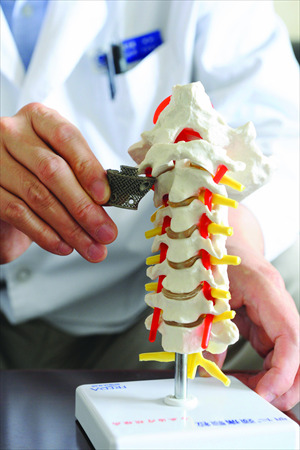 Artificial bones and spinal implants of titanium have been fabricated from the printers and implanted into patients in the trial. Huang Xindi, 54, is one of Liu's earliest patients to receive a fabricated implant. The doctor implanted a prosthetic bone into her spine to treat her spondylosis, and there have been no side effects. "I trust Professor Liu and the technology," she says, noting the severe dizziness she had before the surgery has vanished. 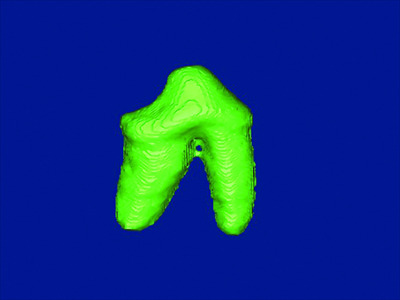 The biggest advantage of 3D printing is providing an individualized and complicated product tailored for each person, since each tooth or bone has a unique shape. Chen Jimin, professor at the Institute of Laser Engineering from Beijing University of Technology, and his colleagues are cooperating with hospitals and local companies to develop 3D-related technologies to use for medical purposes. Chen notes that using the printers in skull repair is already a mature technology. "The traditional way is trimming a piece of titanium roughly into the shape needed to fix the defect, but it's not an accurate method. Now we can scan the good side of the skull and symmetrically build a digital model of the side with the defect, in order to print a metal implant that fits perfectly," Chen explained. "Implants fabricated by the printer are extremely accurate," said Tang. "A traditional tooth implant is screwed into the jaw, but 3D printing allows making a false tooth with the exact same root, and a dentist can just put it in the extraction socket. And in mechanical terms, fabricated teeth can also last longer," says Tang. 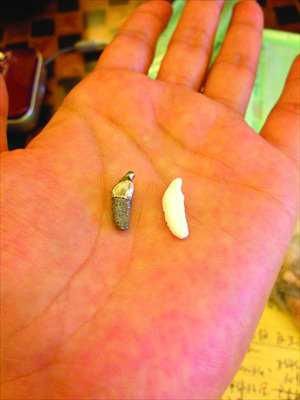 The traditional way of making artificial teeth involves making a plaster model and usually takes more than six months, but 3D fabrication is much faster, costs less and causes less pollution, he says. The fabricated teeth are also very well suited to the jaw bone. "We can fabricate the metals into shapes that include porous structures for vessels and nerves to grow into," Tang explains. Despite of all the advantages of 3D printing, the technology still needs to go through clinical trials, and the China Food and Drug Administration hasn't approved using printed implants in human bodies yet. Patients who have faith in 3D printing should still put their plans for printed implants on hold. For this reason, Tang has been able to fabricate braces, surgical plates and the outer parts of fake teeth, but he has not been able to implant any fabricated products inside human bodies. Tang and his team will finish testing to make sure the implants won't be rejected by the body or harm people's health. Although Chen cannot directly put fabricated bone replacements inside patients, he has already used the technology to print a model of a patient's damaged skull, to help guide the construction of a titanium implant. Liu estimates that it will take at least one year for 3D-printer-fabricated implants to be approved by the government and put on the market. Liu started this research in 2009. In 2010 his department imported a medical 3D printer from Sweden, and started designing implants and doing animal experiments. As far as Liu knows, domestic producers don't make medical 3D printers yet. A variety of implants and printing technologies, including biological materials printing, will happen in the future, says Chen. Using 3D printing and injections of living cells, living organs will probably be fabricated, he said. Experts from Cornell University have already fabricated a replacement ear using the technology, the Sydney Morning Herald reported in February. A report in May said that doctors from Washington, DC, fabricated hearts, and doctors from Britain fabricated a partial prosthetic face for a man disfigured by cancer. "But biological printing is much more complicated than metal printing," Chen said. "Biological printing still seems like it will be impossible in ten years," added Liu. A 2012 report by Wohlers Associates, an American consulting firm, estimates that the worldwide market for 3D printing reached $1.7 billion in 2011. And it says that the medical and dental industries are the third biggest buyers of the technology, comprising 15 percent of the market. The consumer products and electronics sector spent the most, followed by the motor vehicle industry. Some have compared 3D printing to the emergence of factories, predicting it may spark a third industrial revolution. However, ever since the emergence of the technology, voices have veered into two extremes. Among them, Taiwan-based Foxconn CEO Terry Gou thinks 3D printing is "just a trick" because it cannot realize mass production for commercial use, the Guangzhou Daily reported last month. The disadvantage of 3D printing is that the production process will be slower, says Xiao. However, he notes that the technology is still maturing. "We should increase investment," he says.